A British winter can be cold and wet. While wet can be a problem, temperatures only impact on people who don’t or can’t keep warm. On a clear bright day in mid-winter, it can be fun to go out for a walk, well-wrapped up. A warm piece of headwear, scarf, comfortable footwear and warm clothing keeps cold weather out, so why not go for a nice walk? Over the Christmas holidays, especially after plenty of turkey and Christmas pudding on Christmas Day, if Boxing Day is bright, you can walk off some calories. You might need some exercise because there are still some days of celebration to go before the new year begins in earnest. Even if there is snow around, it is only as it freezes and melts that it causes any real problem. Walking along taking in a nice snow-covered setting can be both fun and invigorating. Yorkshire is a beautiful county with its wester border fairly natural, the Pennines. The Pennine Way and the Pennine Bridgeway are lovely walks over in the west. Across to the north west, there is a lovely circular walk at Grimwith Reservoir found off the road between Pateley Bridge and Grassington. The birdlife is an additional attraction on this walk with geese, wigeon and teal local inhabitants. Further east, Fountains Abbey and Studley Royal is another to consider with the chance of seeing three species of deer; Fallow, Sika and Red. Yorkshire has three National Parks and some of the established trails for walkers in North York Moors National Park certainly deserve consideration if you want to walk for a few miles in lovely countryside. Unbelievably, there is around 1,500 miles of trails to explore. The Cleveland Way is an extensive route, best left to the months of summer when you can do long sections, and possibly the whole thing. However, there are sections that you might consider for a bracing Christmas walk and here are three sections to consider. You may even get the rest of the family out to do a route like this because it is only a couple of miles via Craven Hill. Take care if it has been wet because it can be slippery. While the kids may still be playing with their new toys, older ones and your partner may be happy to spend some time outside with you. This walk is a little more in the way of exercise and will take a few hours because the route is 11 miles long. The scenery is great even if there are no leaves on the trees. If the weather is fine and you make an early start, you will be finished around lunchtime with the afternoon left for something else. Like one of these excellent pubs in Robin Hoods Bay. Another short coastal route of 2 miles if the walk from Staithes to Port Mulgrave. Staithes is a delightful little village complete with its cobbled streets. Check out the accommodation, pubs and annual arts festival. The walk to Port Mulgrave across the cliffs is lovely with Cleveland Way trekkers often stopping at the Ship Inn for refreshments. The Esk flows into the North Sea at Whitby. You have 37 miles to cover on the whole of the Valley Walk but you can get an appetite for doing the whole thing when the weather improves by walking just a few miles in mid-winter. The early stages start at Castleton and head to the source of the River across the Moors before you drop down Westerdale and Castleton once again. The Valley goes past Danby, Leaholm, Glaisdale, Egton Bridge and Grosmont before reaching Whitby. The 7 miles walk from Grosmont to Whitby is certainly a popular choice with many walkers. The whole thing would take more than a long weekend but that should not stop you walking a few miles at Christmas. Remember the Esk Valley Railway links Whitby with Middlesbrough and the North Yorkshire Moors Railway Helmsley with Whitby. While you will not see the heather in full bloom at Christmas, there is a lovely walk that starts and ends in Rosedale. It takes in Spaunton Moor and Lastingham passing old kilns, a 9-hole golf course, Ana Cross, the highest of the Moors’ crosses and the edge of Cropton Forest. St. Mary’s Church in Lastingham is an interesting Norman Church and you might like to stop at the Blacksmith’s Arms in Lastingham for a point? It is important to check the weather if you decide to head out for a walk around Christmas time, especially if you decide on one that will take more than an hour or two. Here are a few other ideas and the distances involved if you decide to blow away the cobwebs of Christmas and the weather is good, if crisp. This 6-mile walk is a delight any time of the year and is even suitable for those will limited mobility (wheelchair friendly). Heading south east out of Whitby, you will leave Whitby Abbey behind and soon reach High and Low Hawsker. This ‘’combined village’’ is a very popular camping area during the months of summer. Onwards you go to Robin Hood’s Bay, a small fishing village typical of this stretch of coastline. The circular route past Mulgrave Castle and through the pretty Mulgrave Woods starts and finishes in Sandsend. It is approximately 4 miles of wheelchair-friendly trail. The White Horse at Kilburn can be seen from miles away. It has been lovingly preserved and maintained. You will get an idea of its size if you take the walk that passes it though it may not always be suitable for a winter’s day. This walk from the charming market town of Helmsley is 7 miles long. The ruins of the Abbey that was built in the 12th Century by the Cistercian Order of monks. It was a thriving place in its time with activities halted by Henry VIII’s action against the monasteries during the Reformation. If the weather is particularly good, Roseberry Topping and Captain Cook’s Monument will certainly blow any cobwebs away through forest and over moorland, 7 miles in all. They stand at around 1,000 feet above sea level with Roseberry identifiable by the sheer face on one side and Captain Cook’s by the Monument visible from some distance away. Just because it is Christmas, it is not an excuse to just eat and drink. 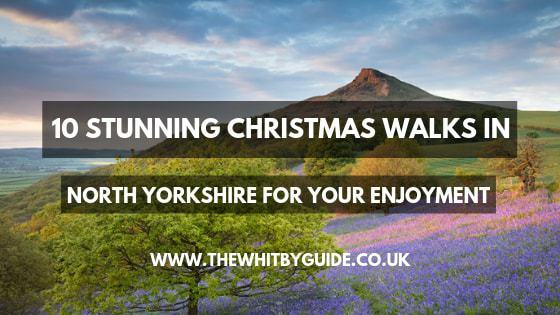 A few hours of fresh air are a lovely way to spend a day during the Christmas holiday and North Yorkshire has plenty of lovely walks where you can get that bracing air. The length of the Christmas break varies depending upon when Christmas Day falls. In 2018, the weekend is the 22nd and 23rd with Christmas Day Tuesday and Boxing Day Wednesday with the weekend coming once again on the 29th. Many people are likely to finish work on the 21st and not return until after the New Year on the 2nd. If you are thinking what to do with all that free time, a lovely walk or two might just be the answer. Loving these Christmas Walks? Pin them!